Year of the Labbit: What Time Is It? 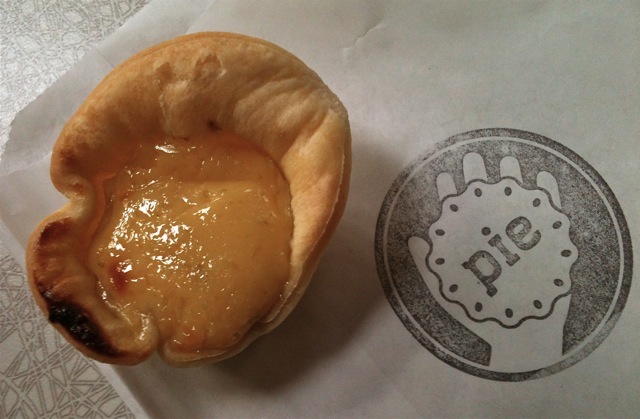 In a darkened corner of the food court in the Armory is small counter full of delightful hand sized pies. 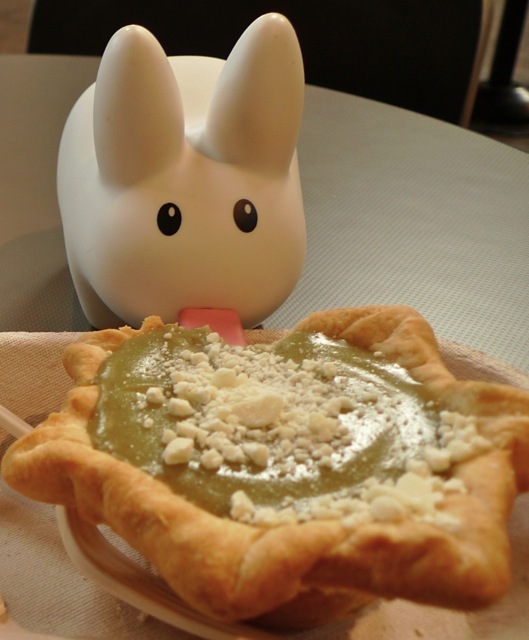 That would be human hand sized pies, which for a labbit would be regular pie size. 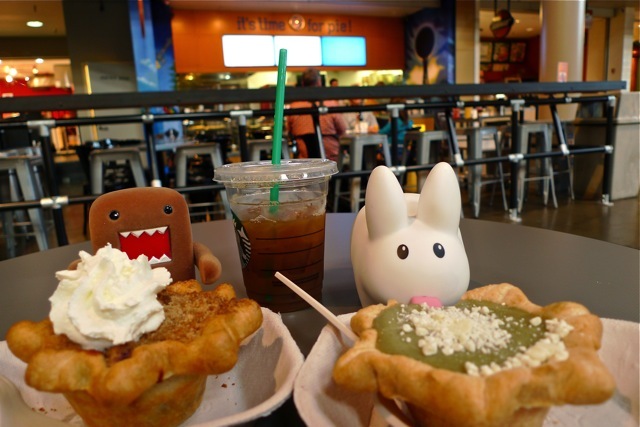 But this shop also makes mini mini pies, which are perfectly sized for domo and labbit and great for humans wanting to try more than one pie at once. 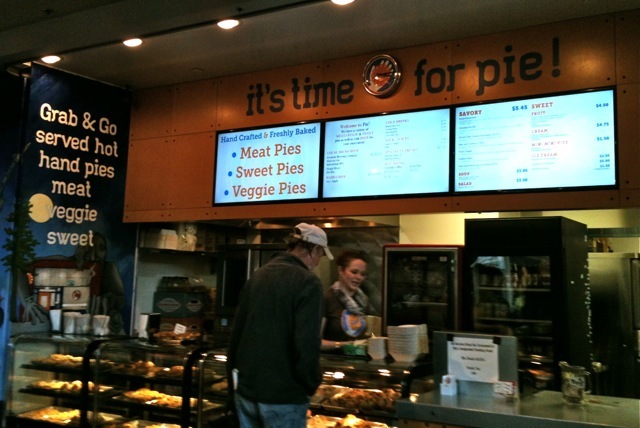 Who doesn't want to try ALL the pies? 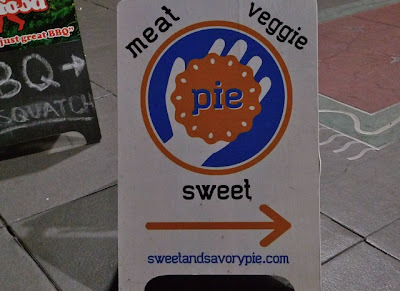 You can see a list of their pie flavors, both sweet and savory, on their website here. Mmmm, lemon custard pie, mini mini sized! Pipkin's saving this for later. If you want to save a little money and don't mind not having fresh-out-of-the-oven pie, you can enjoy yesterday's goodies for the price of π.
Domo couldn't wait to duck into this hand sized apple pie. Human hand sized pie you say? 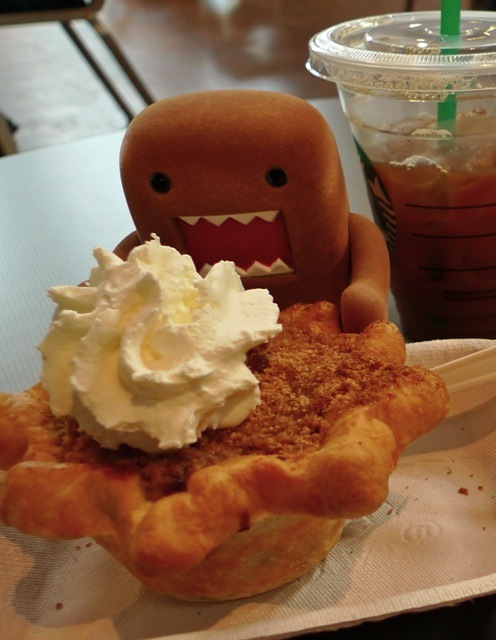 Domo thinks they fit between his hands just fine. Thus, hand pie. Who needs a fork? Rawr! 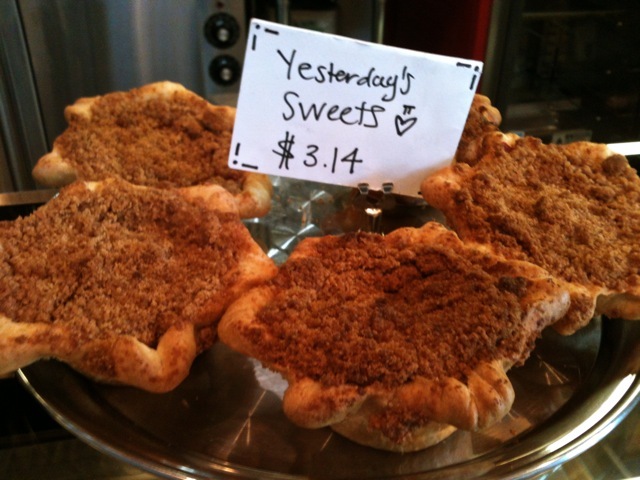 You won't find Pipkin's pie on the menu. He went for a special one-off flavor they were experimenting with for the day. The woman at the counter described it as a "spiced green tea cream pie with white chocolate shavings". They were trying it out to see how customers would like it. It's certainly not your standard chocolate cream pie, banana cream pie, apple pie or blueberry pie. It's rather exotic sounding, but Pipkin loves green tea ice cream and figured green tea cream pie couldn't be too far off the mark. It was delicious! He gave the shop his feedback, but who knows if they'll make it a regular item. Until then, he will have to do his own experimentation in the kitchen.